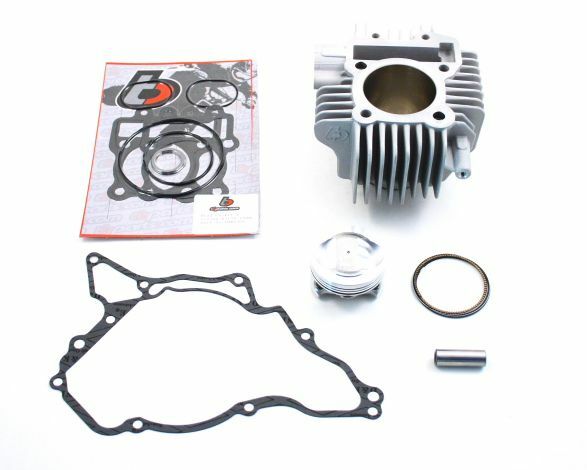 – Ceramic coated all aluminum cylinder (no steel sleeve) – Lightweight high compression domed 64mm piston with rings, pin, & clips – Head gasket kit – Now includes the cylinder head o-ring set and an exhaust gasket. The all aluminum ceramic coated cylinder is lighter than a steel sleeved aluminum cylinder, reduces friction (increasing power), improves sealing, and provides better heat transfer (runs and cools down quicker). This new cylinder along with a complete head gasket kit and domed piston will provide the extra power to make your new Z125 a lot more fun to ride! These are high quality parts and definitely will dramatically increase the power and fun factor on your bike!